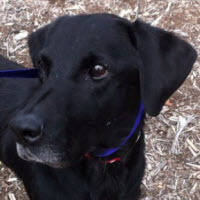 This week we are highlighting the Most Excellent Xander who is available for adoption from Lab-Rescue. There are many labs there who can be fostered and adopted; or if you can’t do those, you can sponsor! Give them a call at (301) 299-6756. Xander is a 4 year old neutered black male. 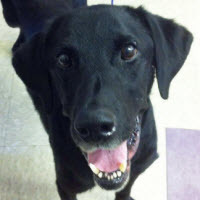 He is up to date on his shots and is heartworm positive; Lab Rescue will pay for his treatment. He is good with other dogs and is approved for kids aged 10 and up. He weighs 45 lbs. He knows some commands including sit and is working on down but would benefit from some additional training. He walks ok on a lead but does better with an EZ Walk harness. He is gentle and friendly and adores people. Xander has settled in nicely here. He loves to play with my two labs and has good house manners. He is housebroken and crate trained. He is gaining weight nicely and has a wonderful appetite. He is very sweet and affectionate and good on leash too. He rides well. Xander loves balls and toys and will play as long as you will let him! He has to carry a ball or toy around in his mouth all the time. It is very cute. He is not destructive of toys at all, he just loves to carry them around! He really has a great personality and is getting more handsome every day as he gains weight. Just thought I would share this funny video with you. This is how he lets us know that they are all ready to come back in the house LOL. He is like “Hey! Whatcha doing in there? Come let us in!” It is too cute!